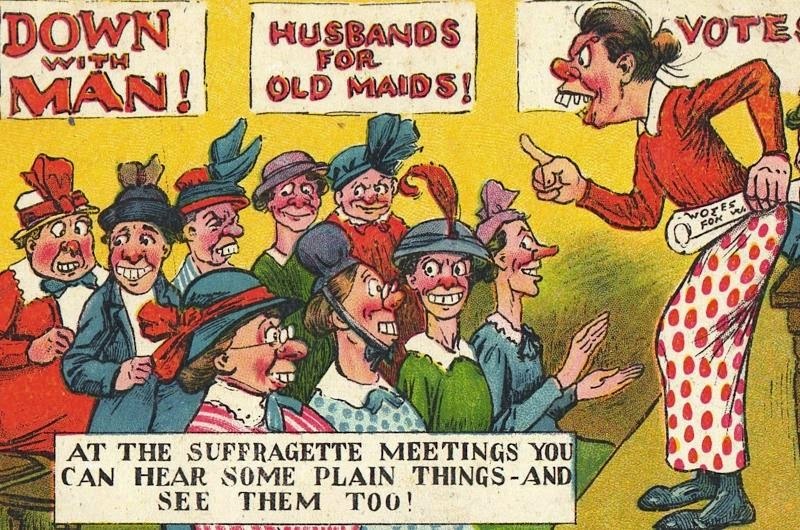 Just as support for women’s suffrage was on the rise by the 1910s, there were equally as vehement opponents to those expanded rights. 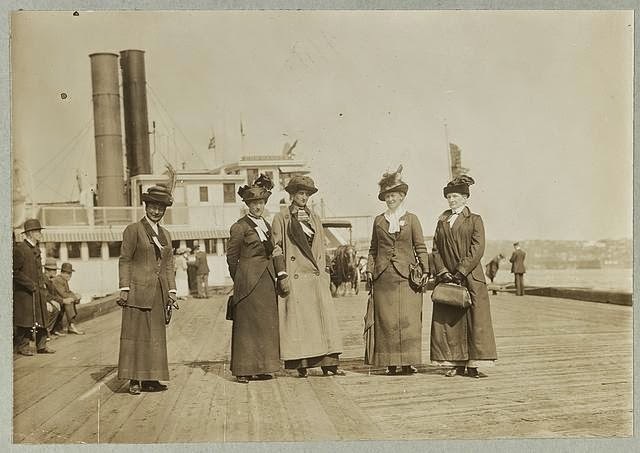 The anti-suffragist movement based its objections on several points that adhered strongly to the stability of civilization and the traditional roles of women. 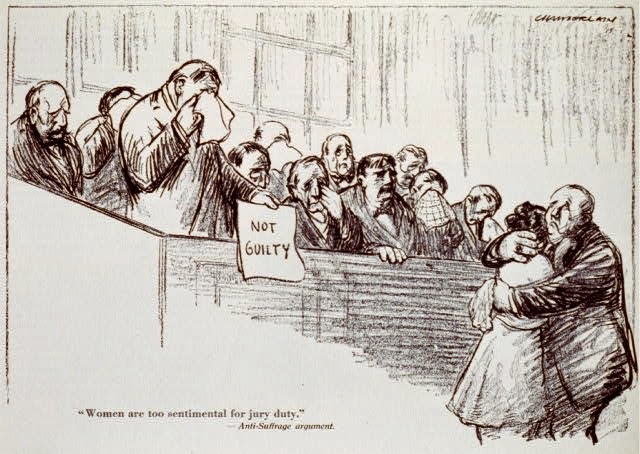 Women were not allowed to serve in juries or in the Armed Forces in 1914, and very few sought out roles in traditional law enforcement. Goodwin’s thinking is that if women can’t actually enforce the laws, they should not be able to determine the laws. Goodwin echoes the feelings of many Americans back then that the right to vote and to elect leaders was not a fundamental right of Americans. Keep in mind that just 125 years before her, many believed that only land-holding white educated men should have the right to vote. And really, Goodwin argues, women don’t really want the vote anyway. Goodwin thankfully avoids mentioning many of the offensive characteristics suffragists supposedly possessed. 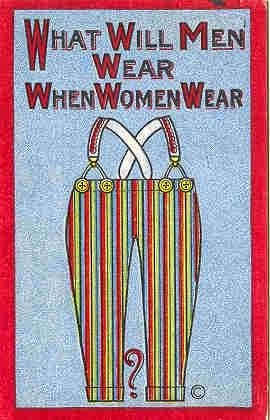 Women can simply piggyback upon the decisions made by men on their ascent through professional circles. Many are already benefiting greatly from this adjacency. So why change anything? Mrs. Goodwin dances around a salient point here — the idea that being outside of politics allows somebody to get things done that would be impossible within the constraints of government. Of course, this isn’t a justification for simply women; today many choose the sidelines as a place to affect change. She’s being accidentally radical here with the notion that because it’s so broken, why even bother participating in it? We all think a version of this every year we go to the polls. It’s the universal notion of my vote doesn’t matter. Mrs Goodwin uses it here as a justification of avoiding the process entirely. 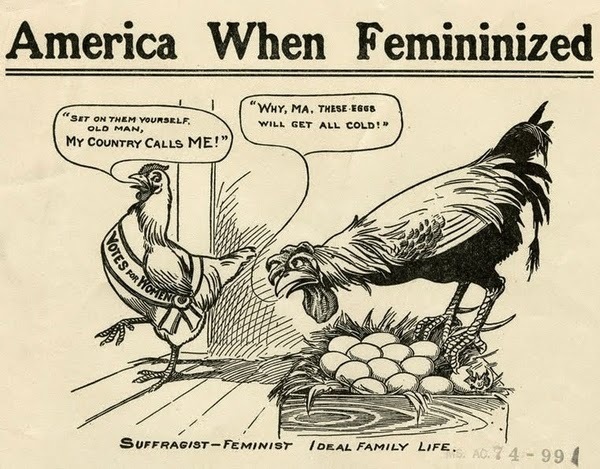 This gets to the fundamental argument of both anti-suffragists and anti-feminists — was it even appropriate for women to be given such a role, when nature has given them other responsibilities such as motherhood and nurturing? A similar refrain echoes through many modern issues today including gay marriage. Creating laws which obviously go against what is so clearly and naturally delineated by the universe is simply dysfunctional and even dangerous. This is another statement which echoes into our current state-vs federal debate of controversial laws. I suspect many will express similar statements in a couple years over another revolutionary Colorado ruling — the legalization of marijuana. 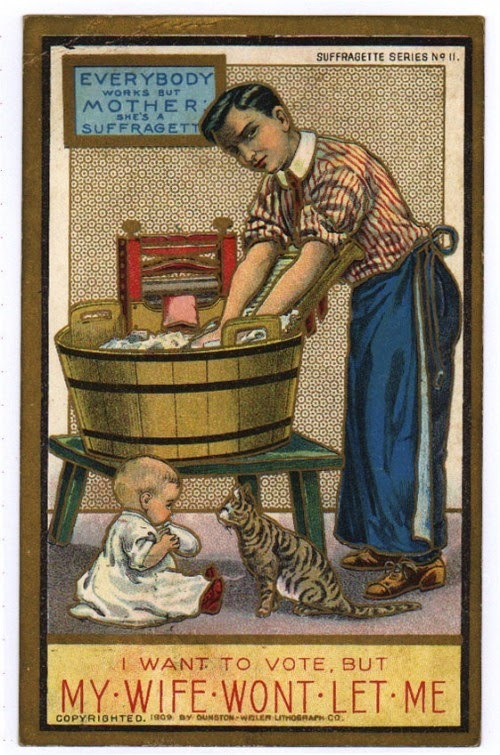 “Our present duties” would include both the traditional basis of womanhood (including giving birth, raising children and creating a home) but also advanced societal roles in church and charity. Mrs Goodwin believes these will be detrimentally obstructed if woman had to participate in the political sphere. And once these roles are compromised, then the fabric of society suffers. 11) “Because it is our fathers, brothers, husbands and sons who represent us at the ballot box. Our fathers and our brothers love us; our husbands are our choice, and one with us; our sons are what WE MAKE THEM. 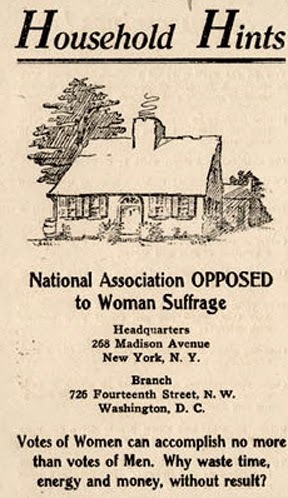 We are content that they represent us, in the cornfield, on the battlefield and at the ballot box, and we THEM in the schoolroom, at the fireside, and at the cradle, believing our representation even at the ballot box to be thus more full and impartial than it would be were the views of the few who wish suffrage adopted, contrary to the judgement of the many. In essence, women are represented in government by those who raised them. They vote when they choose their husbands and instill their values into their children. To give a woman the right to vote would be redundant and only subjects their vote to corrupt forces. 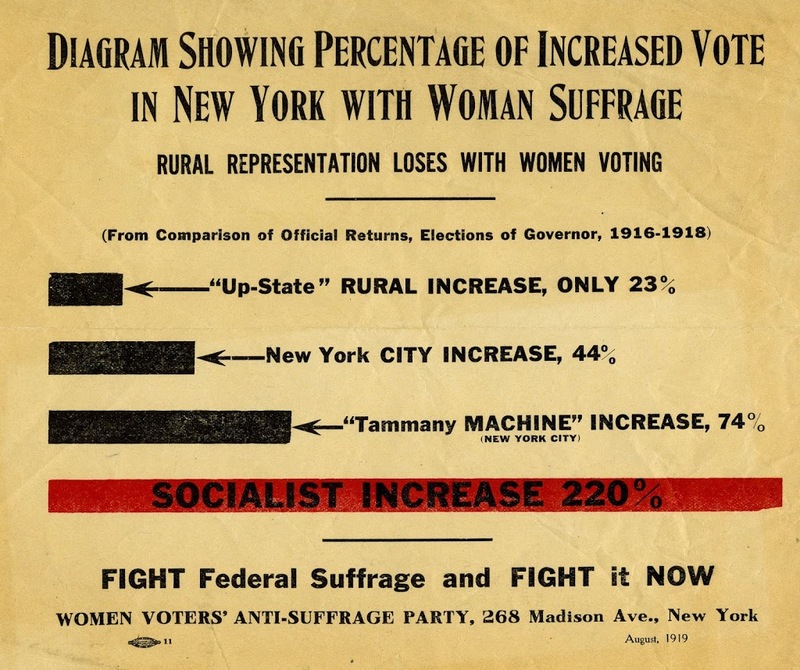 The power that women possess in 1914 America is so unique and instrumental to the current operation of the country that to tinker with this mechanism will only take rights away from women in other spheres.